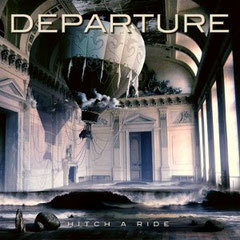 DEPARTURE is the brainchild of American Multi-instrumentalist Mike Walsh who has a vast experience in the music industry. Over the years he has worked on numerous projects, such as Mark Thompson-Smith (Praying Mantis) and Dean Fasano's Message. Mike has also worked with Bon Jovi over the years as well as having produced, scored, written and arranged several New Jersey Bands. Also Mike has had the privilege of playing alongside such greats as Glen Burtnick and Aldo Nova. Now he releases the album "HITCH A RIDE" from Escape Music on April 20, 2012. Produced by Mike Walsh, mixed and mastered by Martin Kronlund at JM Recording Studio Gothenburg, Sweden.